The increasing availability of infant brain MRI data, such as the data collected from the Baby Connectome Project (BCP), affords unprecedented opportunities for precise charting of dynamic early brain developmental trajectories in understanding normative and aberrant brain growth. However, most existing neuroimaging analysis tools, which are mainly developed for adult brains,are not suitable for infant brains, due to extremely low tissue contrast and regionally heterogeneous dynamic changes of imaging appearance, brain size, shape and folding in infant brains. In this talk, I will introduce a set of our pioneered machine learning based neuroimaging computational methods for quantitatively characterizing baby brain development, including skull stripping, tissue segmentation, cortical topological correction, surface parcellation, and missing data estimation and prediction. I will also show neuroscience applications of these methods in advancing our understanding of the baby brains. Dinggang Shen is Jeffrey Houpt Distinguished Investigator, and a Professor of Radiology, Biomedical Research Imaging Center (BRIC), Computer Science, and Biomedical Engineering in the University of North Carolina at Chapel Hill (UNC-CH). He is currently directing the Center for Image Analysis and Informatics, the Image Display, Enhancement, and Analysis (IDEA) Lab in the Department of Radiology, and also the medical image analysis core in the BRIC. He was a tenure-track assistant professor in the University of Pennsylvanian (UPenn), and a faculty member in the Johns Hopkins University. 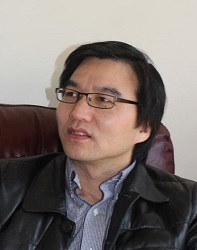 Dr. Shen’s research interests include medical image analysis, computer vision, and pattern recognition. He has published more than 800 papers in the international journals and conference proceedings. He serves as an editorial board member for eight international journals. He has also served in the Board of Directors, The Medical Image Computing and Computer Assisted Intervention (MICCAI) Society, in 2012-2015. He will be General Chair for MICCAI 2019. He is Fellow of IEEE, Fellow of The American Institute for Medical and Biological Engineering (AIMBE), and Fellow of The International Association for Pattern Recognition (IAPR).